Benson (left) is a seven-year-old Lab mix who has gotten into a few fights with Cletus, a one-year-old Pointer mix who is high energy, excited and keeps trying to play with Benson until he has enough which is when the fights have broken out. 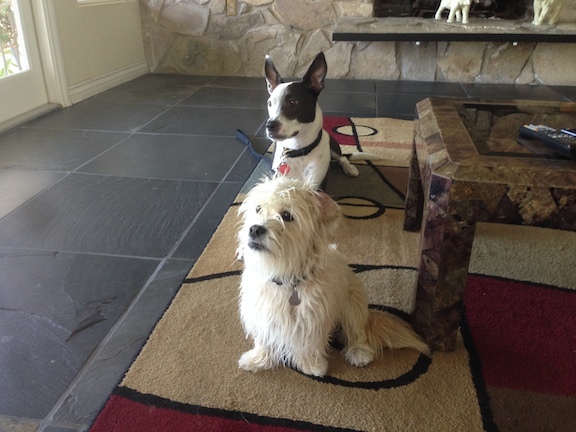 When I arrived for the session, their owner had Benson in another room while Cletus and Leo (the third dog in the house, shown below with Cletus) were playing in the living room. I could instantly tell that Cletus was a high energy dog that had little understanding of the concepts of limits or boundaries. He invaded the personal space of his owner, over barked, ran all over the room and couldn’t seem to calm himself down. I kept him in front of me and blocked him when he tried to jump up on me, something his owner said he often does to guests. When a dog jumps up on a new arriving guest this way, its often to “claim” the person as their property. When a dog thinks it can claim someone this way, its usually indicative of a dog who thinks its in a leadership position. By keeping him in front of me and projecting a confident / authoritative energy and body posture, I was communicating that I was not a human that he could claim. While this stopped him from invading my personal space and attempts to jump up on me, it did not help him calm himself down so I pulled out a leash and attached otto his collar before stepping in it about two feet away from his head. As soon as I attached the leash his energy level dropped considerably and the barking stopped. When we stop or make the dog stop when it gets over excited, we can help it learn that the only way to move forward is by being calm. As I stood on the leash, I discussed this with his owner as well as the fights between the two dogs. Their owner felt that Benson was attempting to avoid Cletus before the fights and this is consistent with dog behavior. Dogs do not follow unbalanced energy and often disagree with dogs who are showing inappropriate behavior or actions. You have probably seen this at a dog park. One dog runs in, runs right up to other dogs or runs around really fast while barking at the other dogs. When it gets close to a confident or balanced dog, its common to see that dog attempt to disagree with the behavior. Sometimes this leads to a fight and even though I had yet to work with Benson one-on-one, I suspected that was the case with these dogs. In this case, their owner had taken to keeping the dogs separated at all times to make sure no fights broke out. While this can work, it doesn’t afford the dogs the ability to learn to behave together. I went over a few ways that he can have the dogs in the same room while also keeping everyone safe. It will be important that their owner get the dogs together in a controlled and supervised way frequently so that they can get used to being around each other again. I went over a few ways to disagree with unwanted behavior and some basic non verbal communication methods. When dealing with an excited dog, I have found communicating exclusively with body positioning, movement and other non verbal ways can be very beneficial. Next I went over a leadership exercise that will help introduce the concept of boundaries while letting their owner practice being in a leadership position. This exercise also helps the dog learn to focus, calm itself down and most importantly restrain itself. Dogs are reactive creatures and this can sometimes get them into trouble. It only took a few repetitions before Cletus was able to master the exercise. Once he did I coached his owner through it with both dogs. It will be extremely important that their owner continue to practice this exercise a few times a day for the next week or two. I gave him some instructions on how to increase the level of difficulty so that the dog continues to be mentally challenged while developing his ability to restrain himself for longer periods of time. I will say that while Cletus had a lot of energy, he was extremely well trained. His owner clearly did a lot of great work with the dogs and it showed. But its also a good example that training and behavior are distinct from one another. There is some carry over, but a dog can be well trained and still have behavioral issues. Next I had their owner bring out Benson so I could see how the dogs interacted and communicated with one another. To keep things safe, we placed both dogs on a leash before bringing Benson out. Benson’s energy level was good. He is an older dog and that maturity had manifested itself in a calmer demeanor. He was alert and confident, but not at all aggressive or attempting to take a dominant posture. He looked at Cletus with soft eyes and only for short periods of time. When Cletus looked at him, he turned his gaze away while maintaining a calm energy. I had placed Cletus into a sitting position to help insure a good experience. A few moments after bringing Benson out, Cletus laid down on the floor next to me. He had certainly seen Benson and looked his way many times, but I didn’t sense any aggression with him either. He was so calm and controlled that I had his owner drop his leash. The dog dint move at all when he did so. As his owner and I discussed the body language to watch out for, Benson laid down on the floor six feet away from myself and Cletus and turned his back to us. Dogs never show their back to an animal they consider a threat so combined with laying down, these were huge signs that Benson was comfortable and not attempting to take a dominant position. 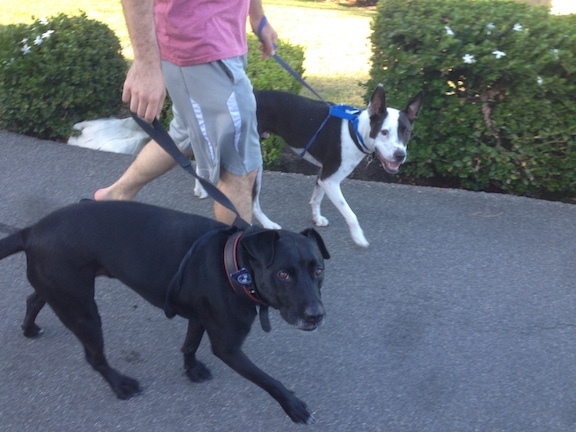 While out for the walk, I had their owner keep them on opposite side and in a heel position. Benson was far better on the leash than Celtus, but Cletus wasn’t half bad either. I offered a few suggestions on how to correct the dogs from any pulling and we practiced a few commands that will help the dogs learn to stop and look to their owner for guidance when they don’t know what to do or when called. After a short walk without any problems, I suggested that their owner walk them together this way to help them have time together in a communal way. By keeping them both at a heel, but apart, we can help them experience being together in a situation where their owner has things under control. We finished the session by feeding the dogs in a strutted way in the same room. I had their owner eat a snack first so they dogs saw him as being in the top position (in a group setting, leader dogs eat first). Once he was done he controlled who got to eat and when while telling the other dogs to keep a respectful distance. This was the first time the dogs had eaten int he same room in a long time. By having dominion over the eating ritual, their owner will be able to give the dogs a daily reminder that they are in a follower position. Neither Cletus or Benson are aggressive dogs. Its most likely that Celtus was simply playing in an overzealous and over excited fashion and eventually, Benson had enough. By controlling the situation and correcting Cletus when he gets too excited, Benson will defer to his owner to handle the situation. As long as his owner interrupts and calms Cletus down before he gets over excited, he will be able to stop any future conflicts before they get started. It will take time, practice and careful observance of the dogs when they are together to ensure the energy stays at an acceptable level. Each time Benson has had enough and his owner stops Celtus from attempting to continue playing, the chances of a future outbreak go down even more. Eventually Cletus will start to stop before he gets too excited and govern his own behavior. Once this is the case, the days of dog fighting between these two should be gone for good.